Mobile payments, like Apple Pay and Android Pay, is a nascent technology saddled with the ambitious goal of unseating the simple, plastic-y way of paying for things. It hasn’t been going so well. 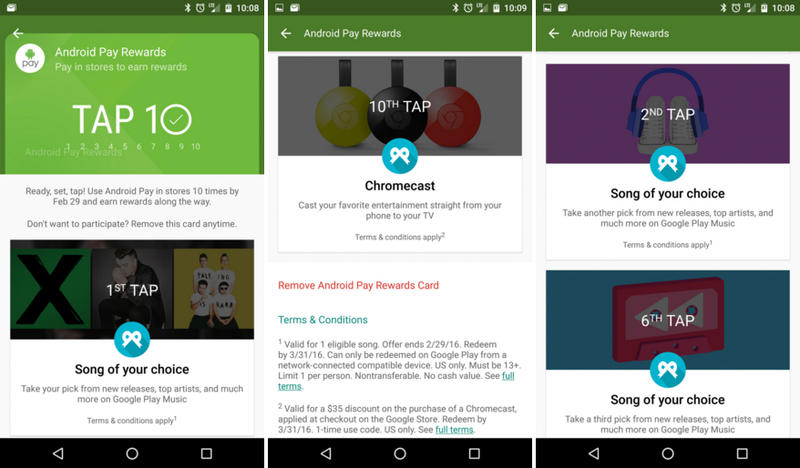 Now, Android Pay is using another tactic to change people's minds—giving away free stuff. In summary, images posted at Droid Life show how it all works. For your first tap, you get a song. Second tap, song. Sixth tap? Yep, a song. But for the 10th tap... free Chromecast! Not too bad! Unfortunately, Android Pay still hasn't made it our shores. So no free Chromecast for you. Rumours back in October mentioned that Google was working on a way to entice users over to Android Pay, especially after being somewhat late to the game with its revamp of Google Wallet. Unlike Google, Apple hasn’t offered direct rewards for using its mobile payment service though some companies have linked their own rewards programs with Apple Pay itself. Absent official release, the terms and conditions says the offer ends February 29th, 2016 and Google will probably start the promotion very shortly, possibly sometime today. Who knows if it’ll give a much-needed jolt to the erratic heartbeat of mobile payments.